The MacGregor Family: "Look Mom! No hands!" 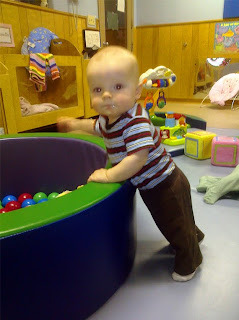 This is a picture (from phone) that I took today when I went to feed Jackson at daycare. Not only did he pull himself up into the standing position for the first time today, but he decided that he would hold on with one hand, and then no hands. He did pretty well and stayed up for a long time. He also inched his way around part of the circle. I think we are really going to be in trouble soon! We MUST childproof the house! Wow, Jackson!! Def time to child-proof the house! Such a big boy! Slow down Jackson! Wow! Looks like you've got a little over achiever on your hands. No stopping him now - hold onto your car keys!